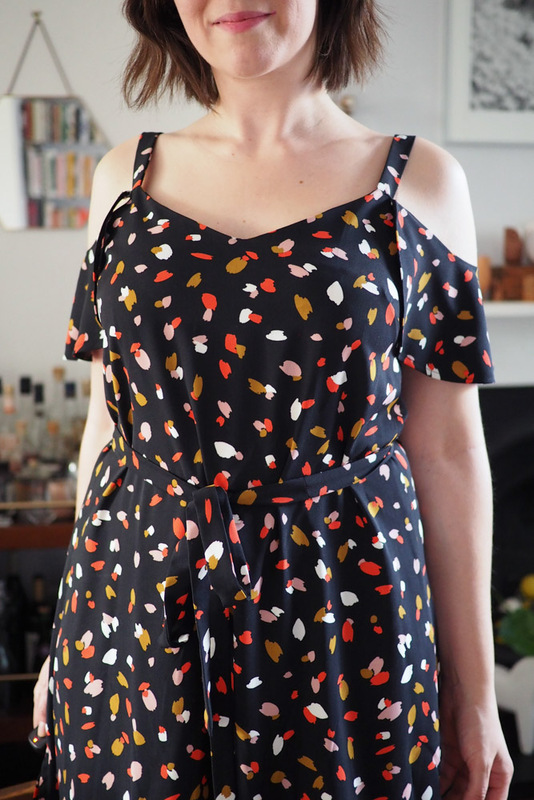 I’m a bit late for the Sewcialists’ Tribute Month, but this garment was very much inspired by Shauni of The Magnificent Thread! 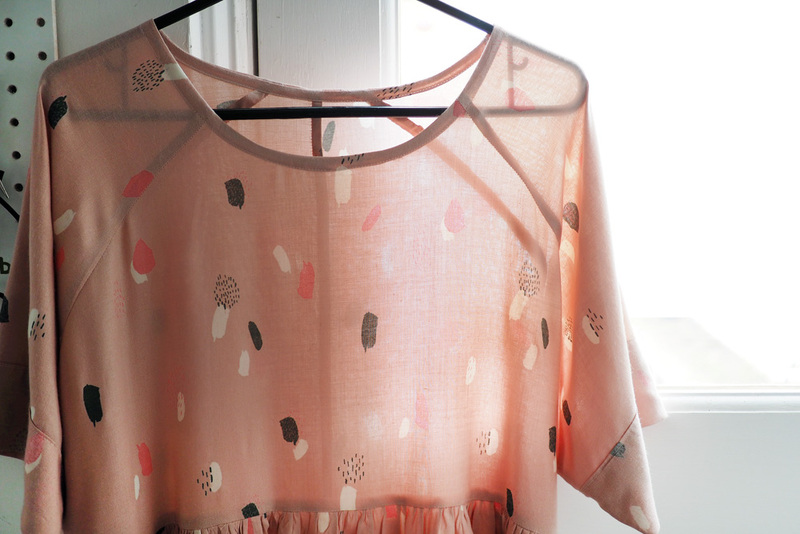 It’s a Ralph Pink Sahara shirt; Shauni has made two beautiful versions and slowly coached me into buying the PDF. 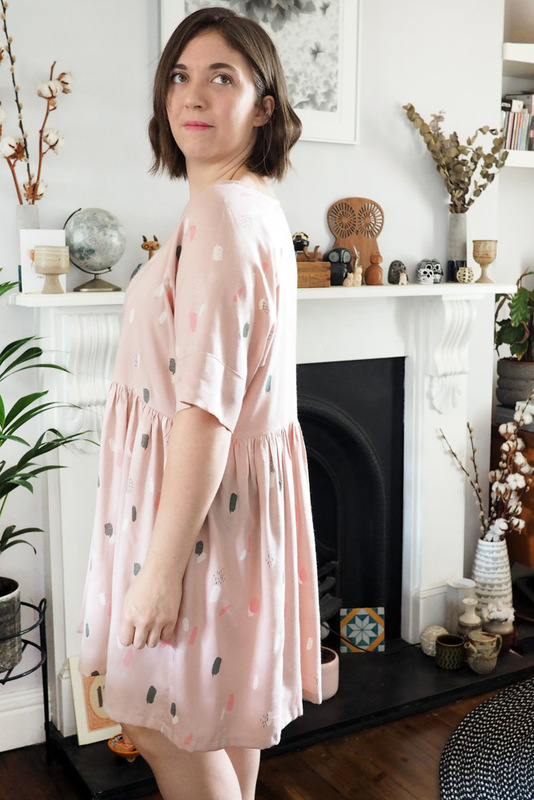 This was my first time sewing a Ralph Pink pattern, and it was a largely positive experience. The PDF layout is a little different to usual but once I figured out which markings to match it went together easily. 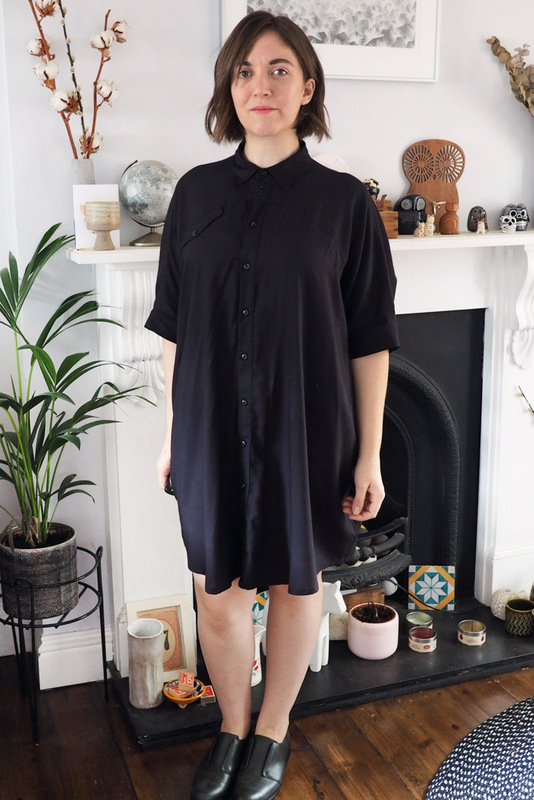 The instructions are well illustrated but a little brief in places so a beginner may struggle, but this pattern is fairly standard shirt dress construction so I found it fine. 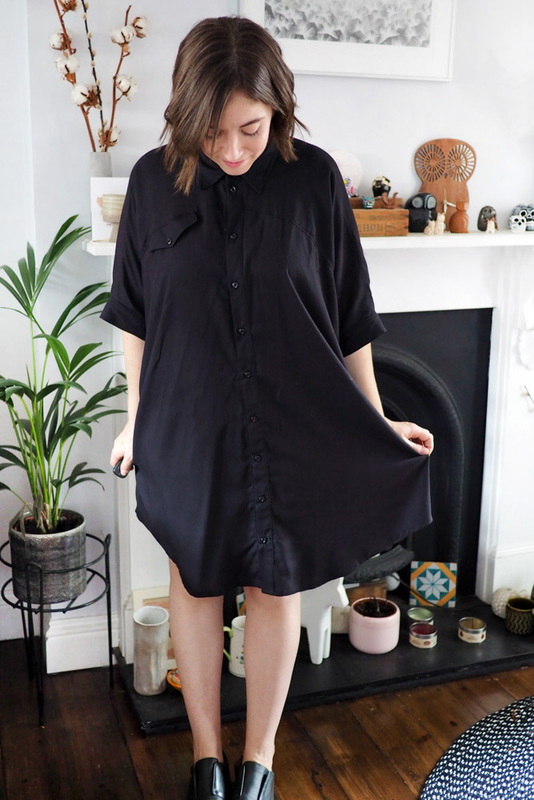 The Sahara is obviously very oversized so I cut a size small without toiling and I’m pretty pleased with the fit. 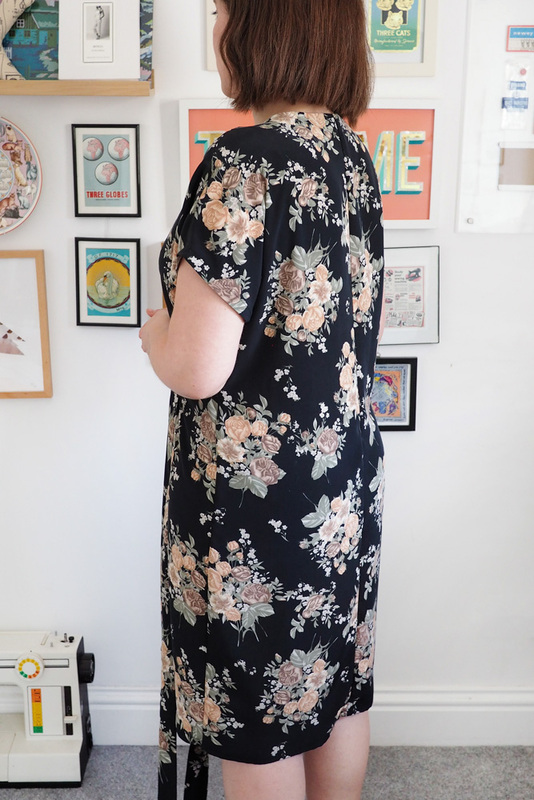 The only adjustment I did make was to take an inch off the hem length and slightly level off the dipped hem in the back. 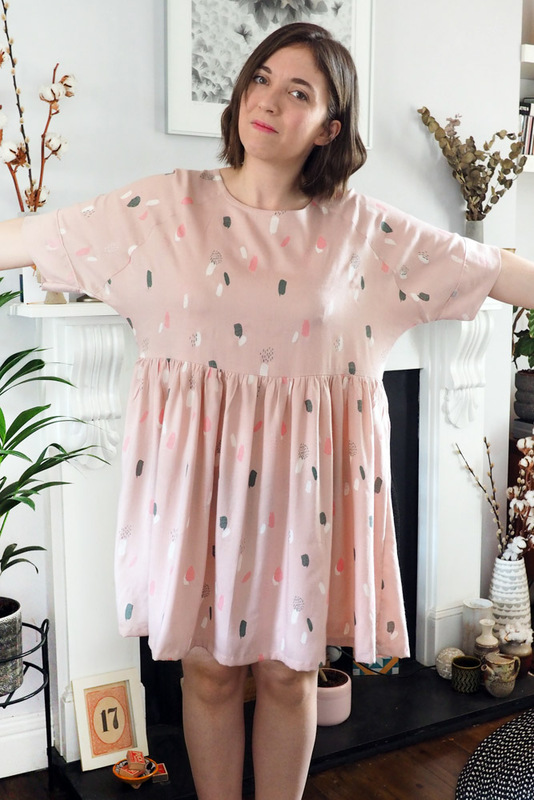 I did notice that my side seams are buckling a bit; I’m not sure if I got something a bit off-grain or the slightly bulky seams under the arms are causing it to drag a bit. 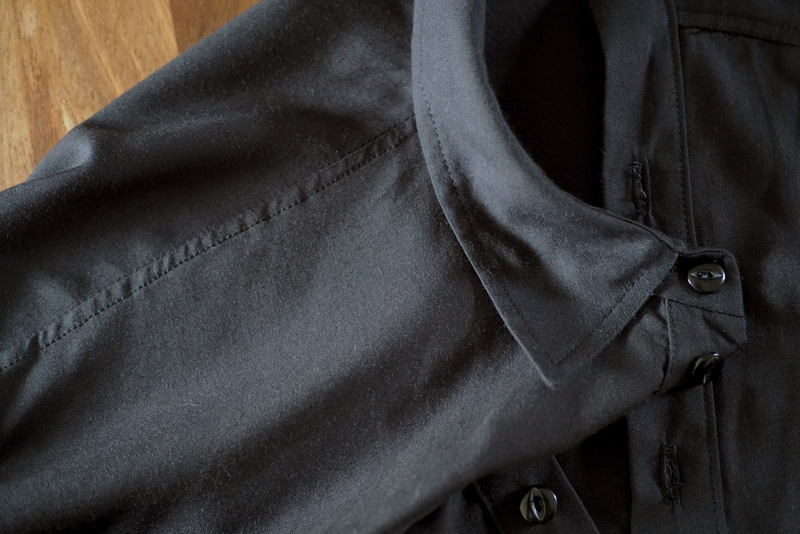 Collar open… I think I prefer it fully done up. I especially adore the fabric I used which was a perfect match for the pattern: it’s an organic woven bamboo from Ray Stitch. 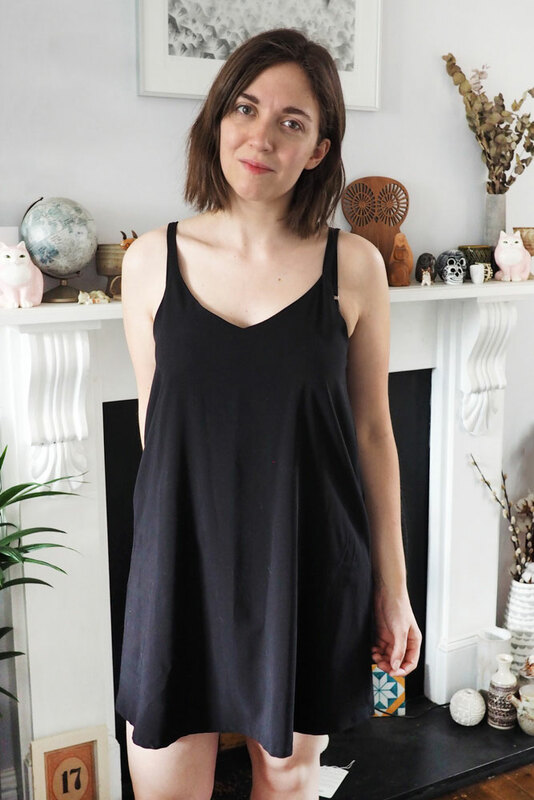 I’ve never seen woven bamboo fabric before but it has the same silky smooth hand and soft drape of bamboo knits and was a dream to work with, taking a press beautifully and easy to manipulate around the curved hem yet still pretty stable so easy to handle. It has an almost sanded/peached finish and doesn’t seem to crease too badly. I used a size 60 microtex needle to make sure it didn’t snag. 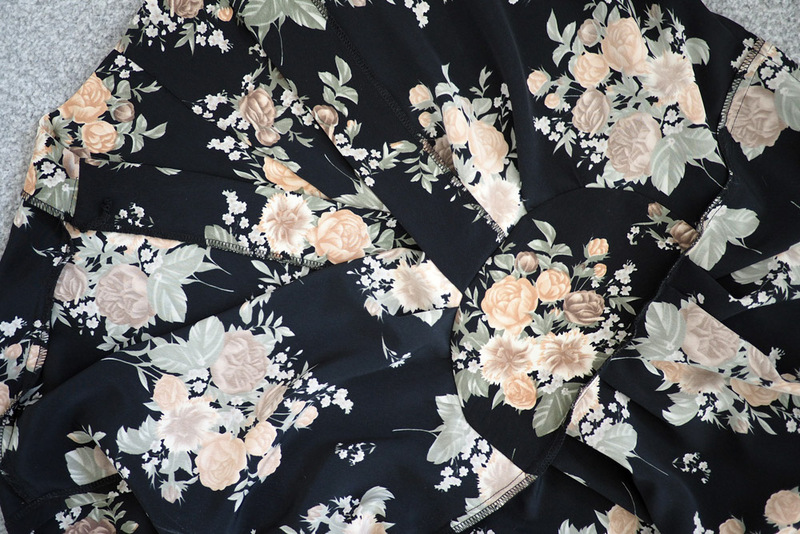 I might buy up some more of this fabric in white and try dyeing it as it’s basically dream dress fabric. 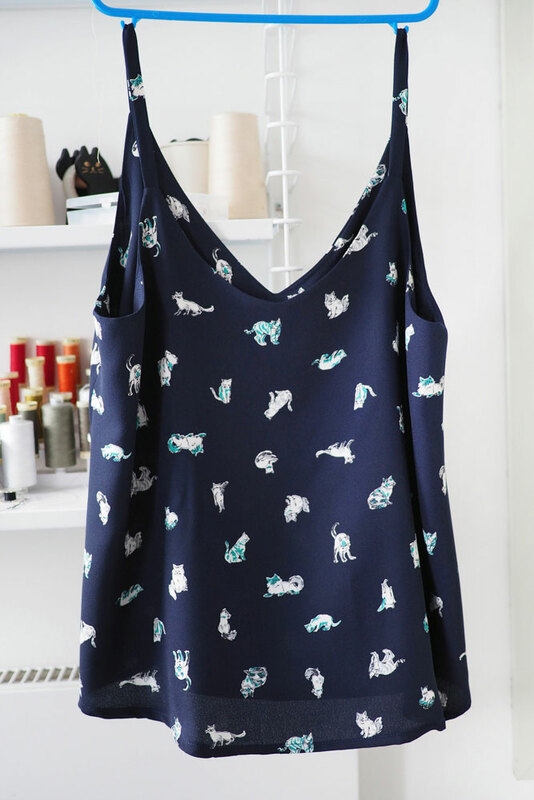 I feel rather like a fashionable bat wearing this, and I’m pretty into it! Needless to say, it’s insanely comfortable and being basic black it’s going to get a ton of wear. 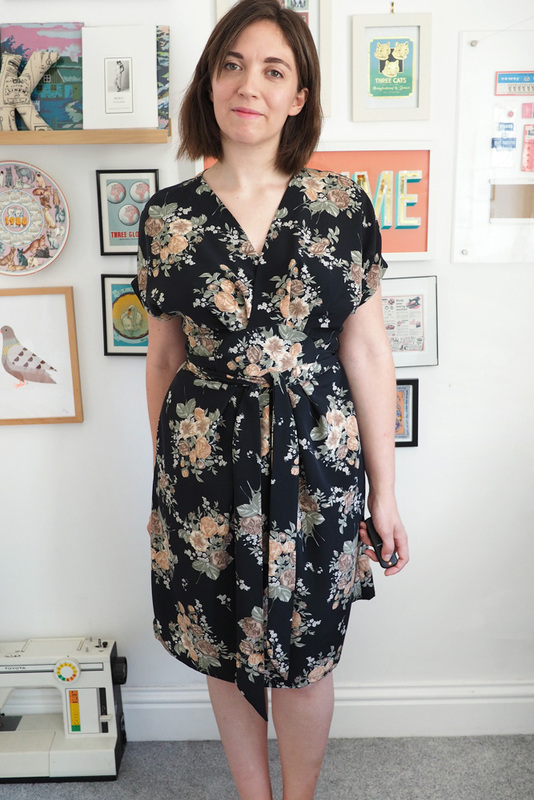 Much as it pains me to consider autumn weather, I feel like this’ll work great with tights and boots as the temperature dips. I feel like it’d work well worn open as an overshirt too. I’ve just got a new job after a summer contracting and having some delicious time off, so it’ll be great for work too. 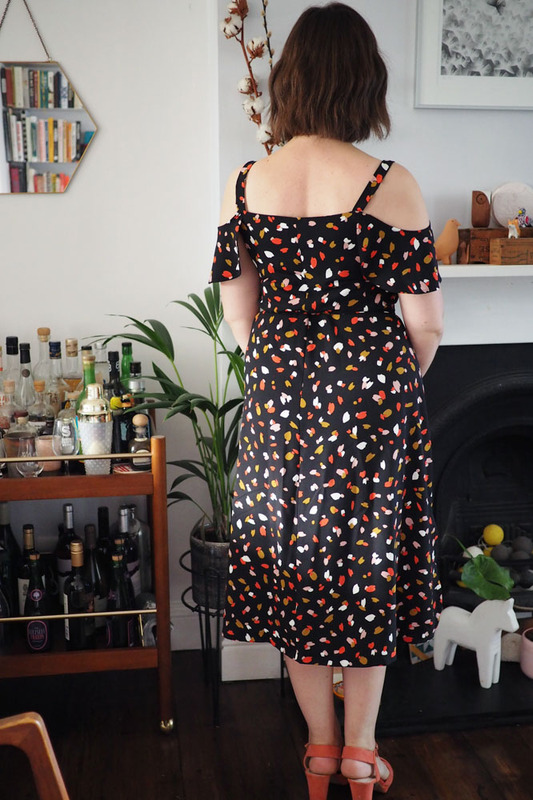 More Saharas: Self-Assembly Required, Paprika Patterns, Frock and Sew, and of course thanks again to Shauni for the main inspiration! P.S. 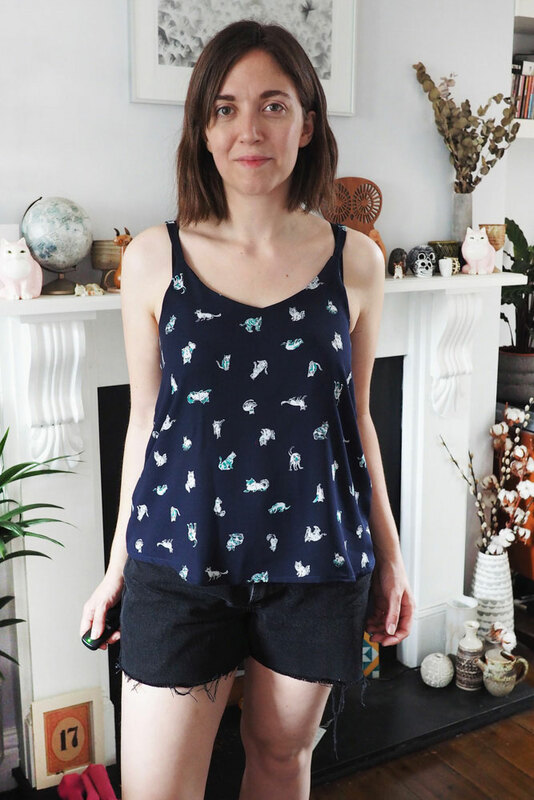 If you’re reading in a reader, I gave my blog a bit of a fresh look – click on over to have a look! P.P.S. 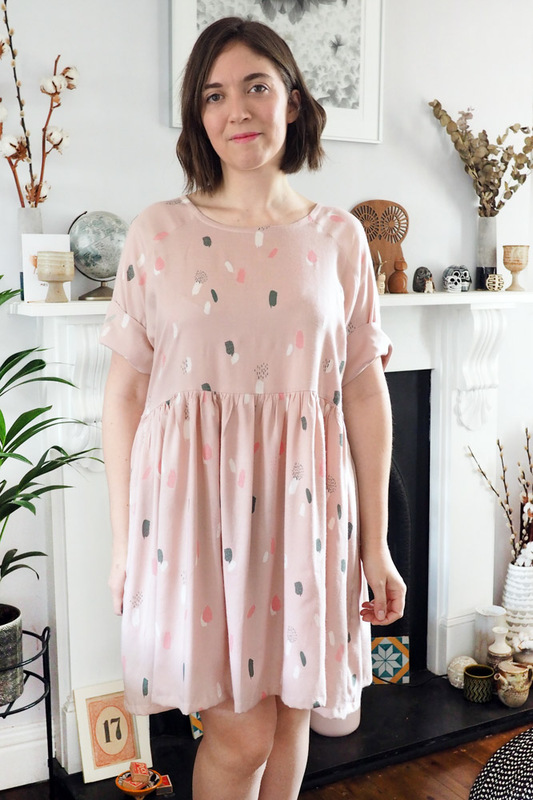 If you’re not on Instagram, you may have missed that I was a guest on Helen and Caroline’s excellent new podcast, Love to Sew, talking about my sewing and blogging journey. You can find my episode here or on all podcast apps. 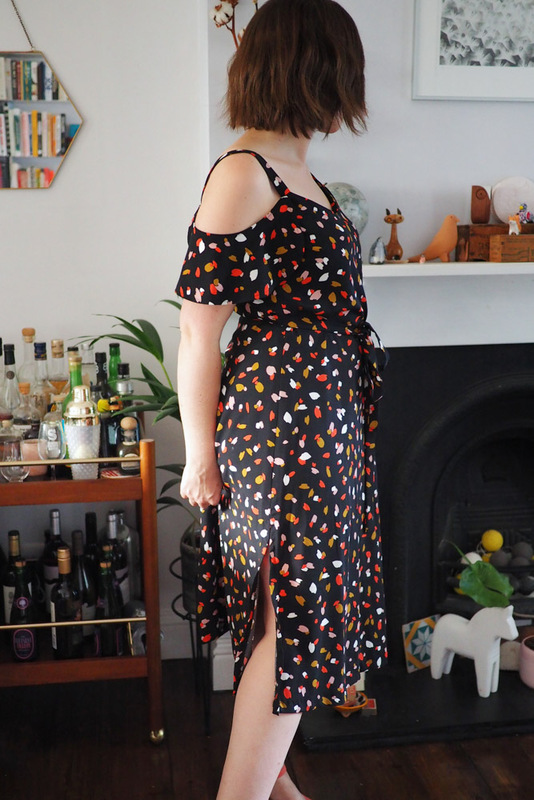 I made this a little while ago, wore it to a wedding, and completely neglected to get photos – but I dug it back out to photograph with no occasion whatsoever, as I think it turned out so nice it needs sharing! 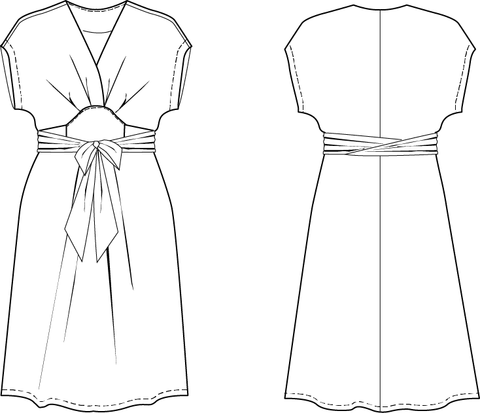 I also added some side slits, and made a simple waist tie to draw in the fullness. All the tweaking was worthwhile as the fit turned out great and it was super comfortable. I did find the instructions given to add the little sleeve flounces disappointing. 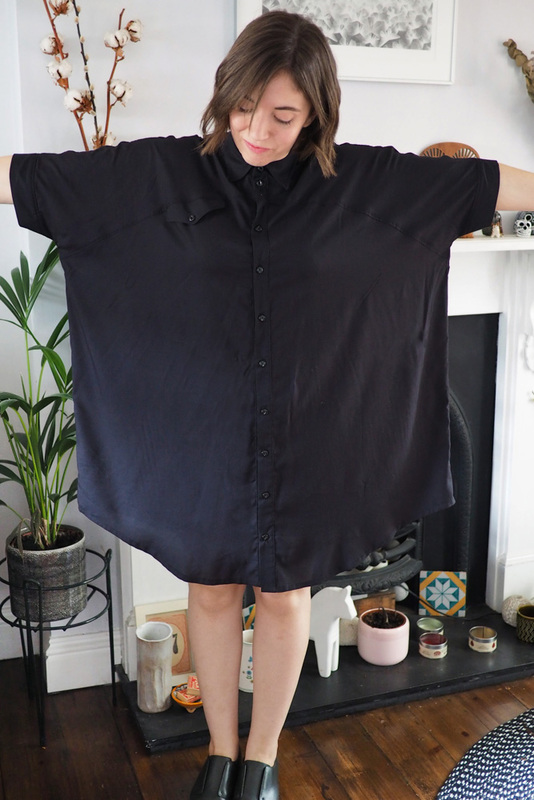 Firstly you are instructed to hem the highly curved edges using a 3/8″ hem allowance: LOL NO, not going to happen. 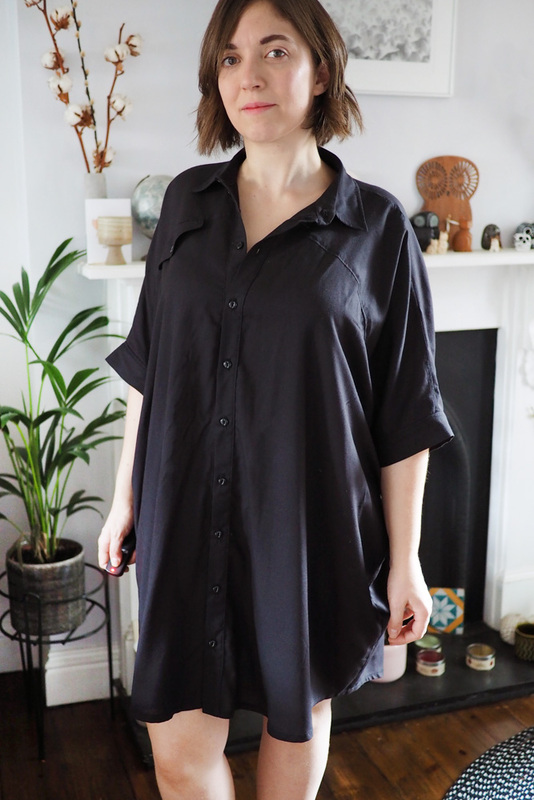 I overlocked the edge and used that as a guide to turn in once and make a baby hem which only just worked out ok with a judicious use of steam. 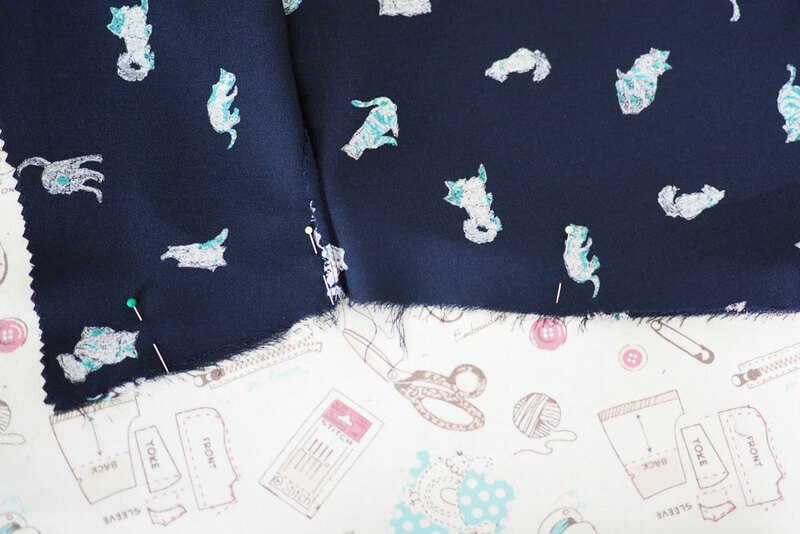 For a nicer finish I think it’d be a good idea to self-line the flounces, especially if the fabric has an obvious wrong side like this one does. 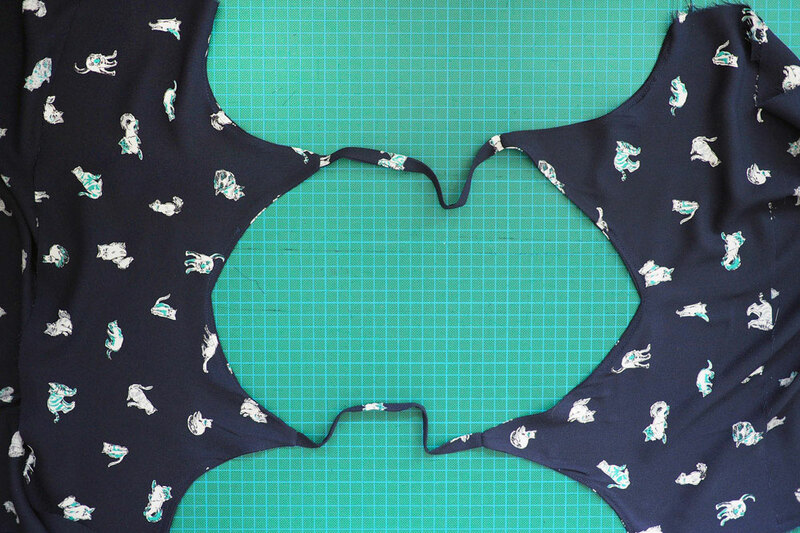 Also the flounces are just tacked on by hand at the end of the sewing process; I think it’d be neater if the corners were extended a little and they were caught in the seam that joins the strap to the bodice. I’ll do that next time. However this does mean I could unpick the flounces if I get bored of them! 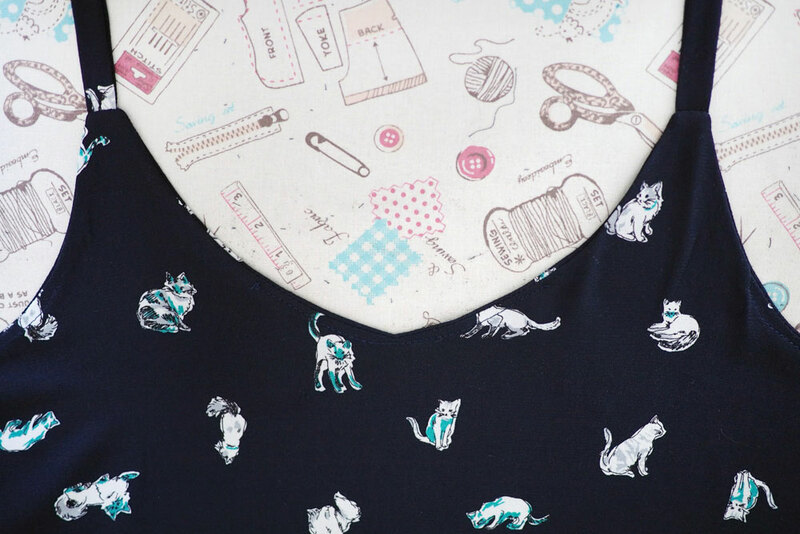 The fabric is my buy of the year so far: it was from a random little shack-shop (with a kitty!) on Ridley Road market in Dalston and was a ridiculous £2 a metre. I bought six metres in excitement and passed some on to Amy. 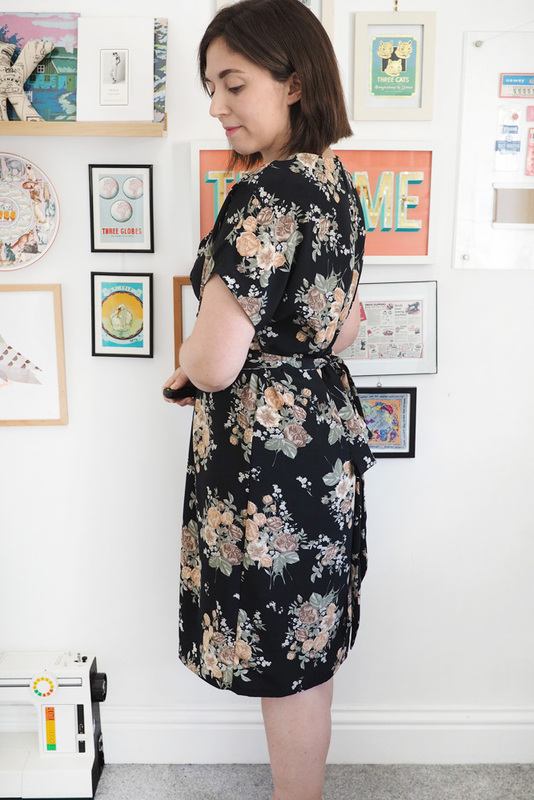 It’s a heavy polyester crepe and I’m in love with the swishiness and print (which is not dissimilar to my Atelier Brunette Cassiopee!). Wedding season seems to be over for us now, but I’ll definitely dig this back out for future occasions. 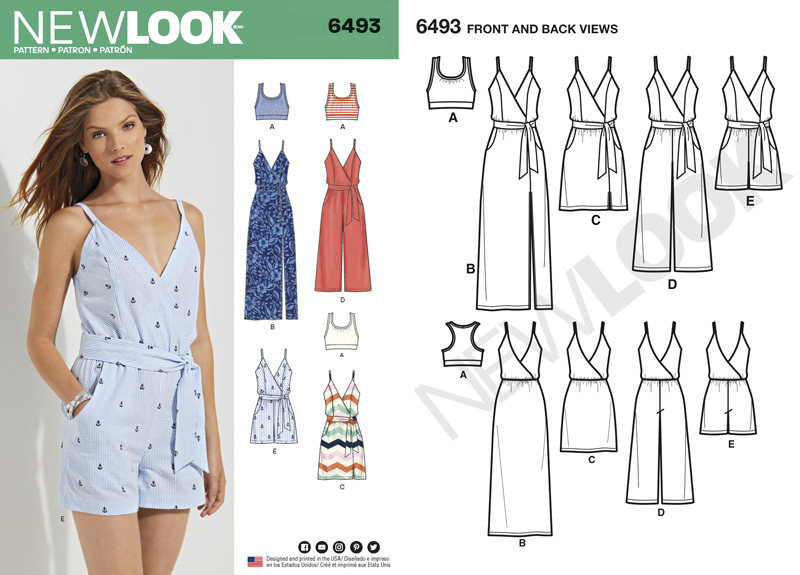 Summer wedding season has opened, and this is a New Look 6493 jumpsuit I made for the first occasion. 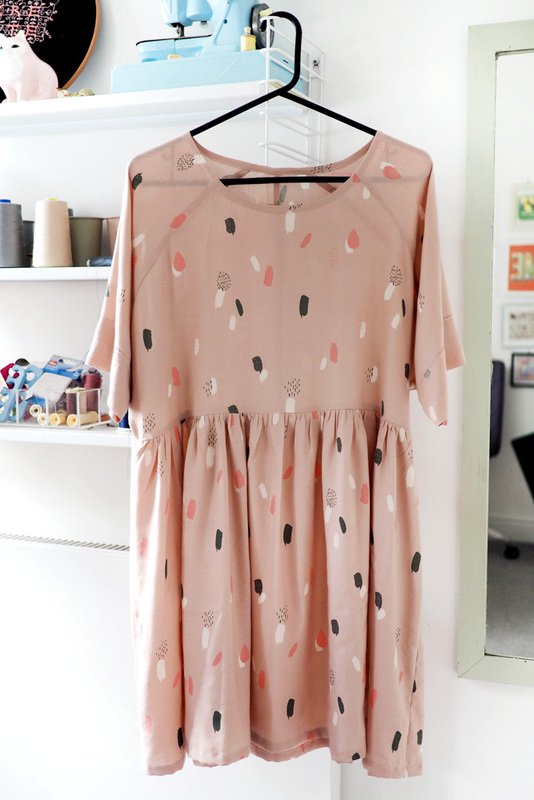 I really like this final garment, but I did have some difficulties getting there with the pattern! 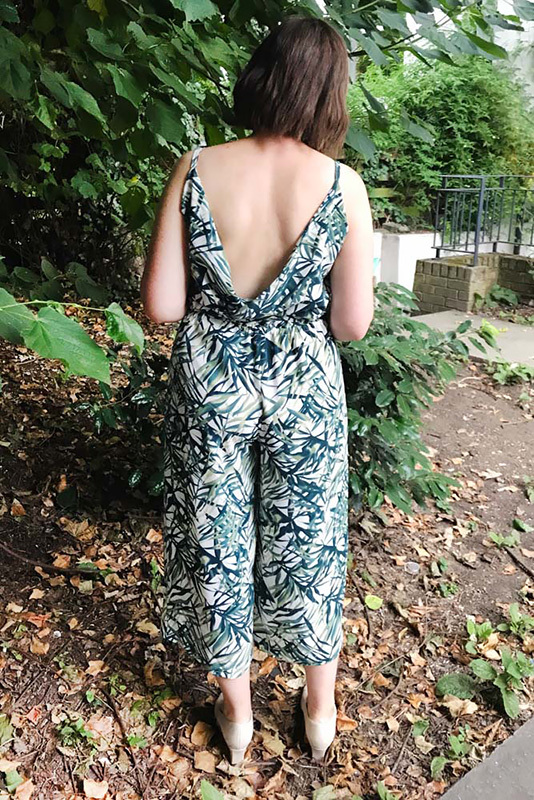 I ended up fixing it by overlapping both the front and back a couple of inches more than patterned, hiking up the straps a considerable amount and taking in the side seams, then lightly gathering the trouser waistband in the newly-smaller bodice so they still lined up. 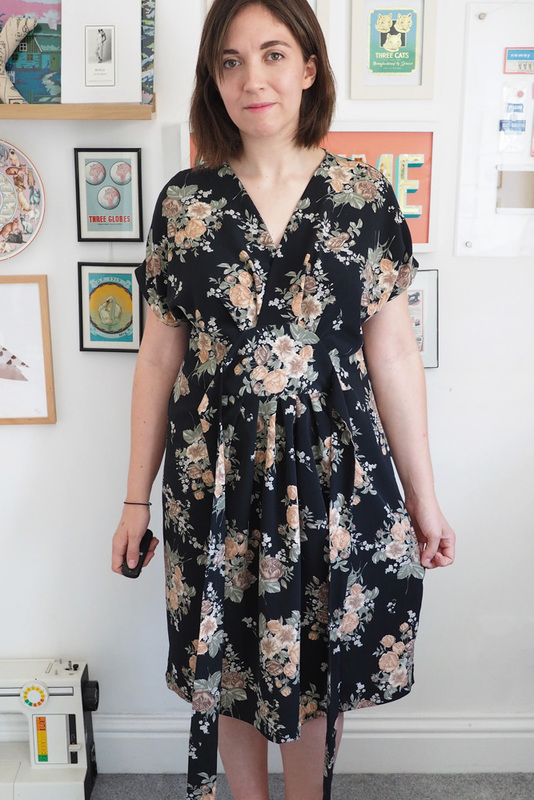 I put a little safety pin through the front neckline to keep it in place and could also do the same in the back, however for the wedding I just left it loose and cowl-like (and went braless!). 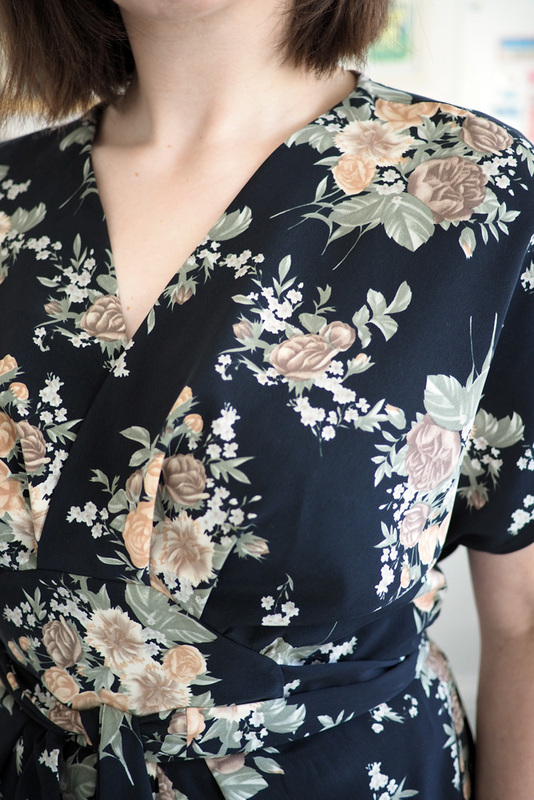 At least the fabric was well-behaved, a lovely lightweight poly crepe from Minerva, and the print hides where I had to fudge around with the fit on the bodice, hah. 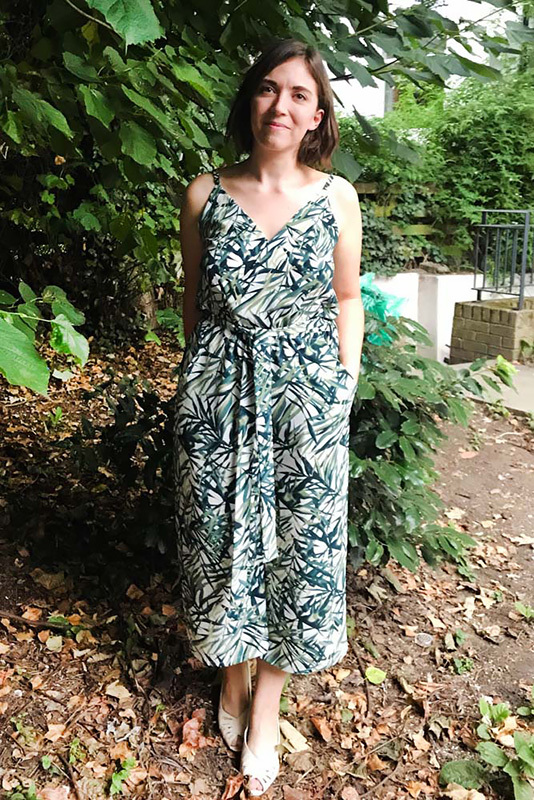 This was really nice to wear to a warm evening wedding: the elastic waist meant it was super comfortable and even braless I felt very secure in the top after all the tweaks. 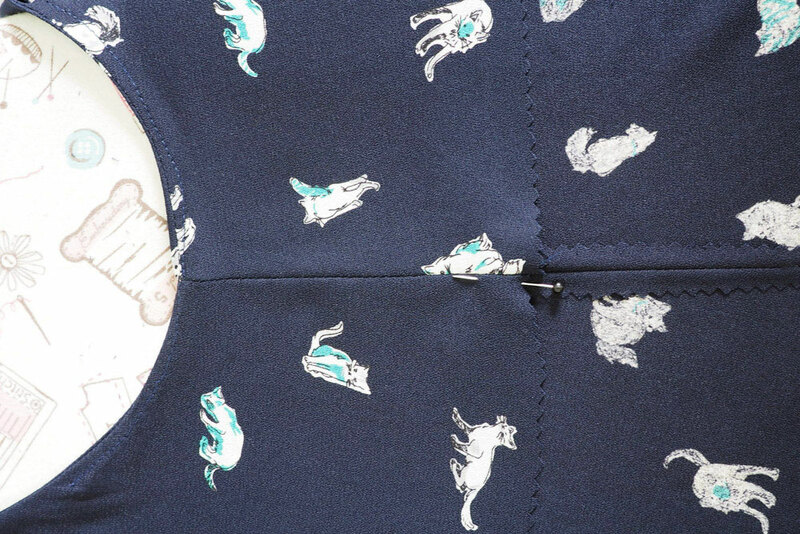 I’m not sure I’ll make this pattern up again as I don’t think the bodice design is worth tinkering with to fix and the very low back means it’d be difficult to wear in the daytime (I might try layering a tee under it though). 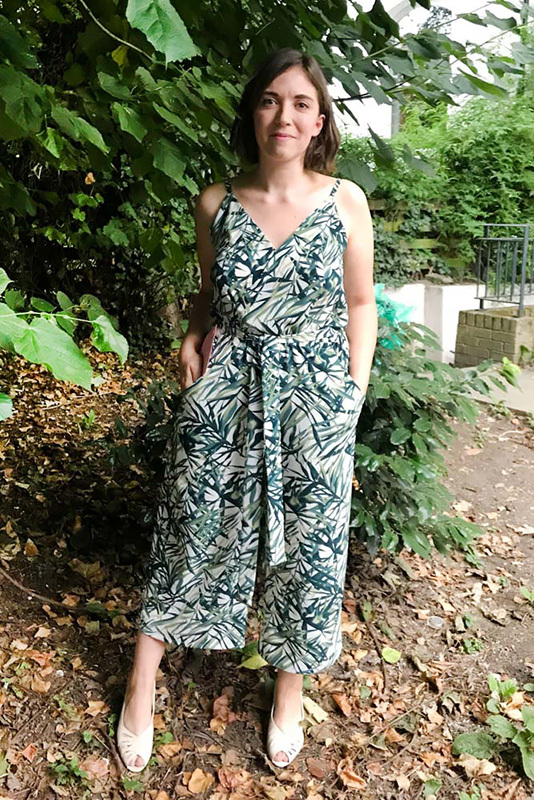 However I do really like the fit in the trousers – especially the single-piece pockets which were deep enough to hold my phone and cards so no bag required, hurrah – so I might splice on a simpler cami bodice for more summery jumpsuit fun. 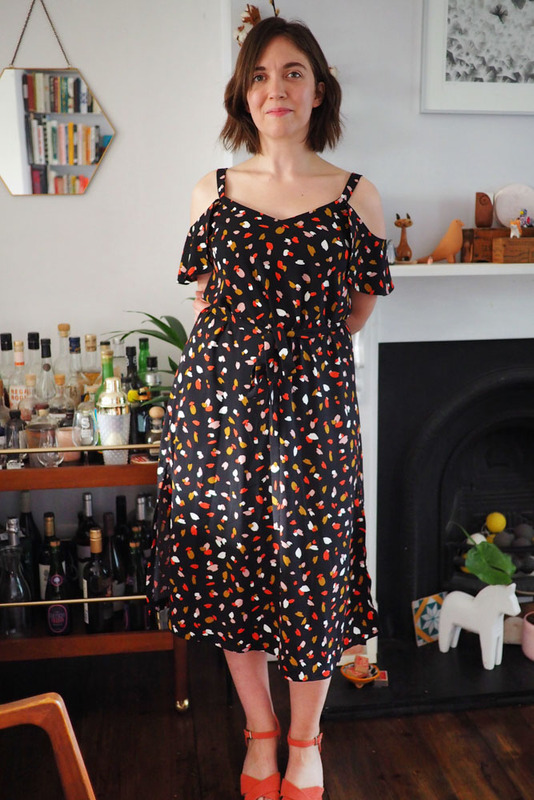 I have three weddings to attend in the space of a month starting mid-July, so I’m getting ahead on making some pretty dresses to wear to them! 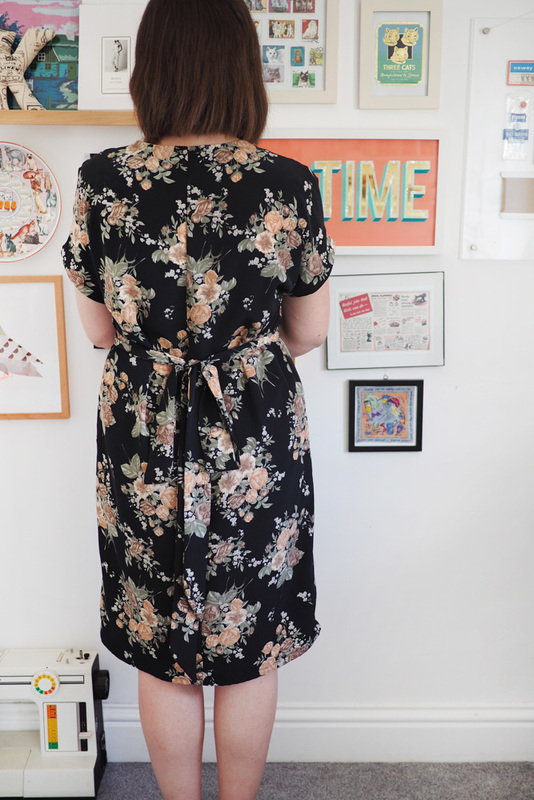 This one is the Wardrobe By Me Akinori kimono dress, and in pleasing synergy I bought the fabric on my recent trip to Tokyo, Japan. 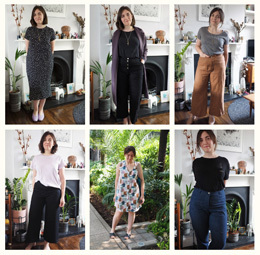 Danish indie pattern company Wardrobe By Me were a new find to me. 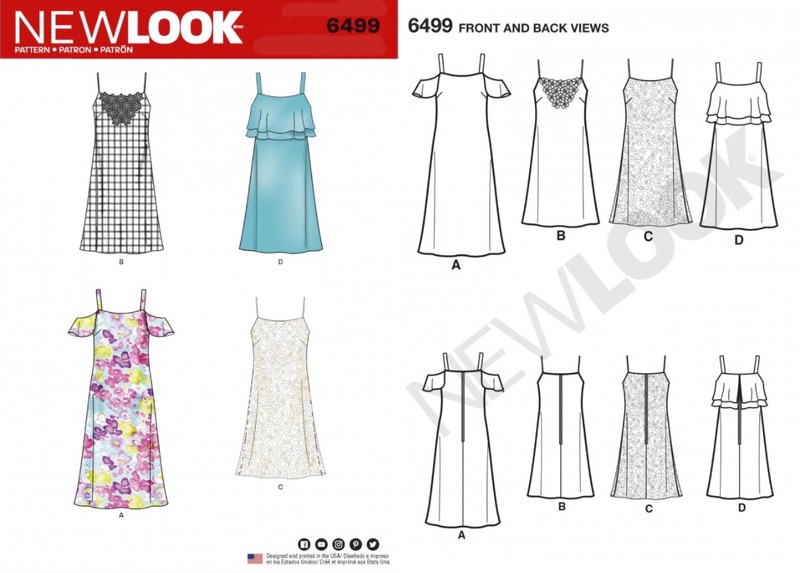 I can’t even remember where I first saw this pattern but the PDF got snapped up as soon as I clocked the line drawing. 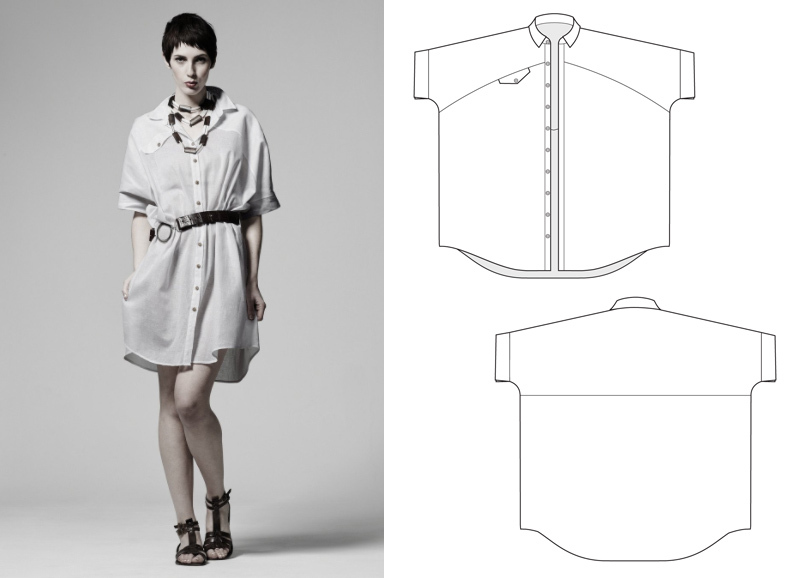 I love the wrapover front with soft pleats, cut-on sleeves and integrated tie belt. Sewing it up was crazy fun, and very fast. 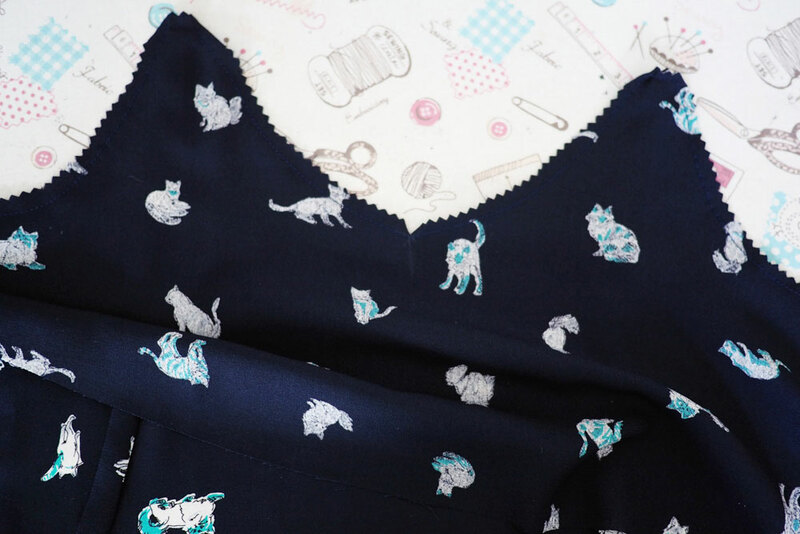 It’s not nearly as complicated as it looks, with just four main pattern pieces plus the ties and facings. 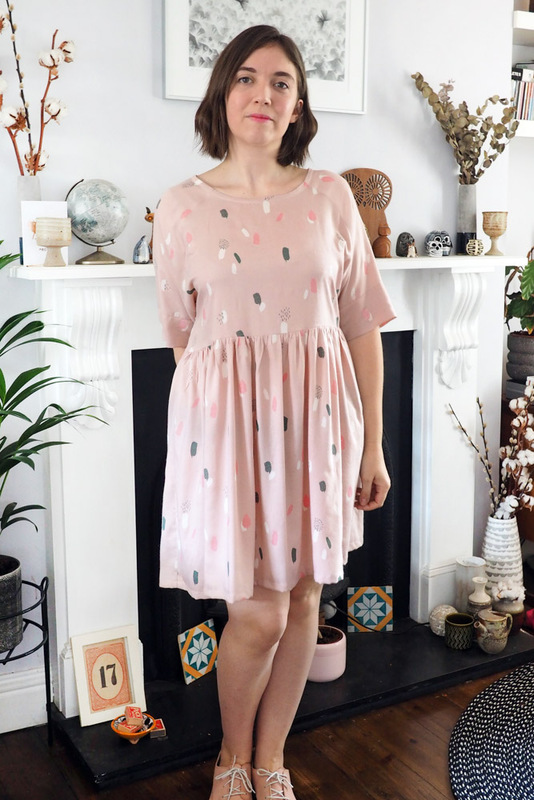 The pattern has some clever construction details, like a cut-on facing for the front neckline which simply gets folded inwards and connected to a separate back neck facing to make an elegant topstitch-free finish. 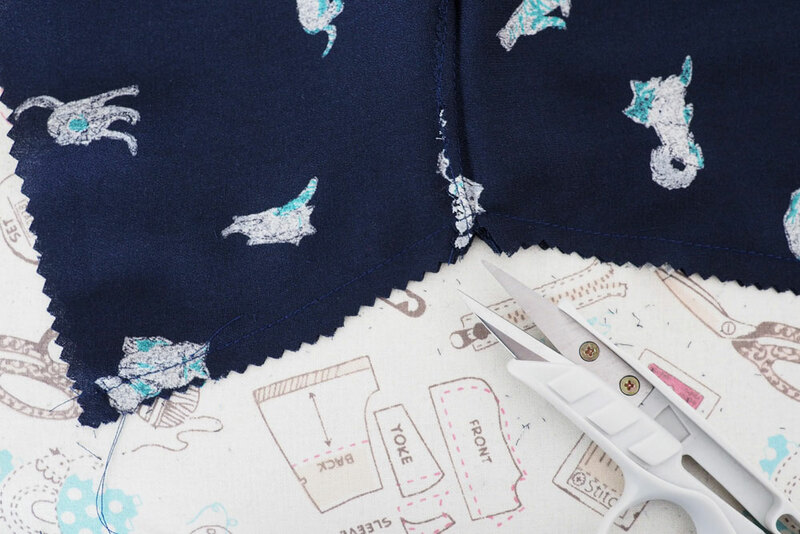 It was also fun to sew up the semicircular waist detail at the front, cleverly constructed in a such a way that all raw edges are concealed inside. 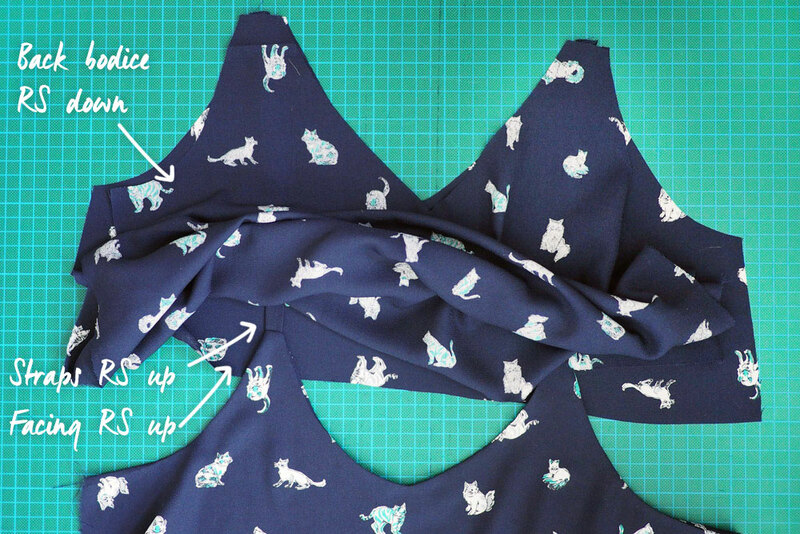 The PDF is a manageable 23 pages, with instructions to self-draft the ties rather than needlessly print a large piece, a detail I always appreciate. The instructions are great too; I would say geared towards non-complete beginners as only the trickier aspects include illustrations. The only thing I thought was missing was a direction to finish the raw facing edge, which I did early on before basting to the semicircle panel. 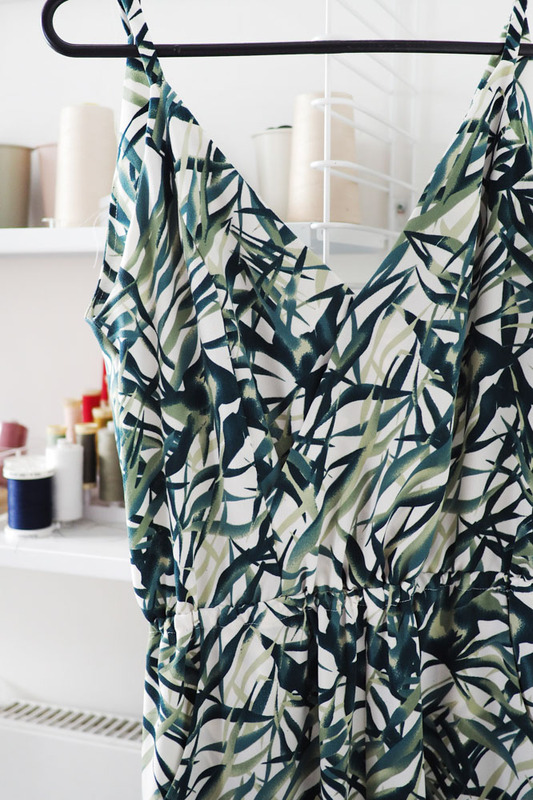 The fabric is a polyester that’s doing a pretty damn good job of imitating sandwashed silk. At least I don’t think it’s real silk by the price I paid for it in the Okadaya fabric store in Shinjuku; it wasn’t more than £6 a metre. Not all polys are created equal; this one is slinky and drapey yet was remarkably well-behaved to work with. The sandwash effect gave some grippiness and it pressed well with no melting or plastic smells. 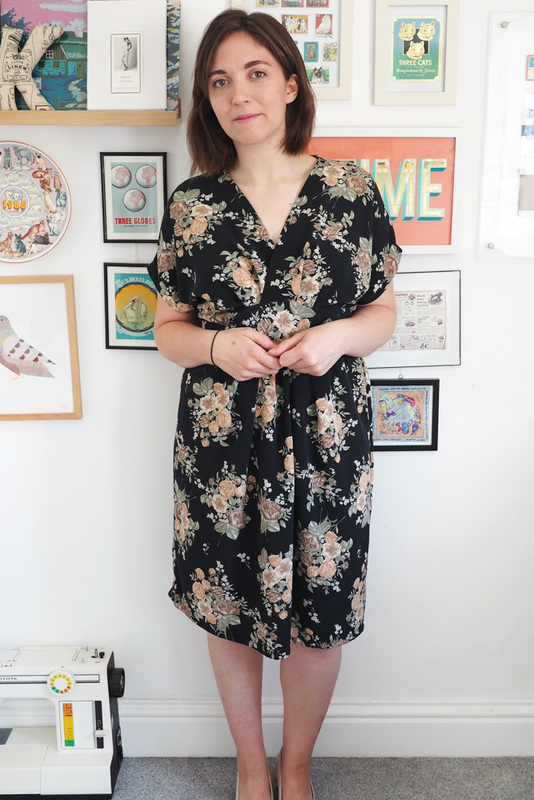 The ties can also be omitted, which gives a really nice loose but still shapely fit, and are long enough to wrap around to the front to tie there too. 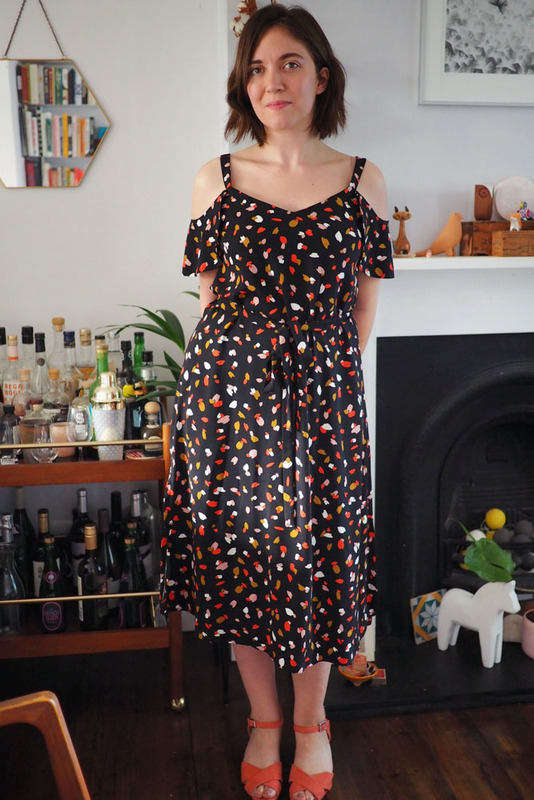 I’m thrilled with this dress; it was such a nice sew and perfect for a summer wedding. 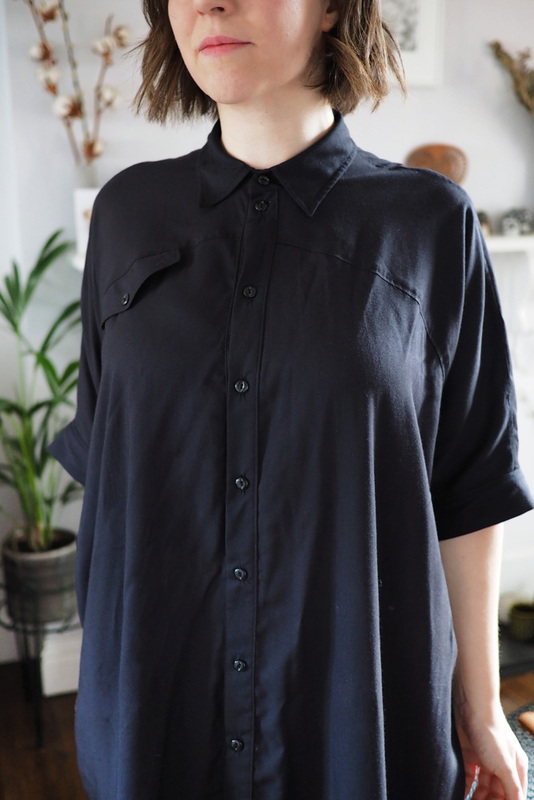 I’m plotting a daytime version of the Akinori now, perhaps in an ikat cotton or chambray without the ties.